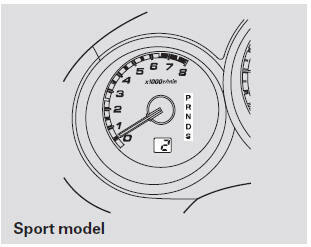 These indicators on the instrument panel show which position the shift lever is in. 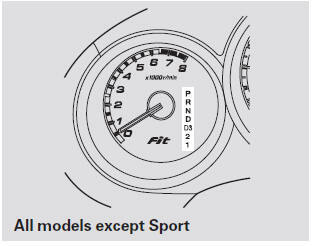 The ‘‘D’’ indicator comes on for a few seconds when you turn the ignition switch to the ON (II) position. If it flashes while driving (in any shift position), it indicates a possible problem in the transmission. If the malfunction indicator lamp comes on along with the ‘‘D’’ indicator, there is a problem with the automatic transmission control system. Avoid rapid acceleration, and have the transmission checked by your dealer as soon as possible. 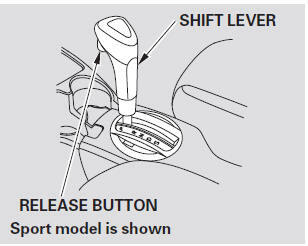 To shift from Park to any position, press firmly on the brake pedal and press the release button on the front of the shift lever, then pull the lever. You cannot shift out of Park when the ignition switch is in the LOCK (0) or the ACCESSORY (I) position. If you have done all of the above and still cannot move the lever out of Park. 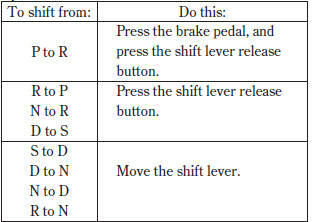 Press the brake pedal and press the release button on the front of the shift lever to shift from Park to reverse. To shift from reverse to neutral, come to a complete stop, and then shift. Press the release button before shifting into reverse from neutral. This position is similar to D, except only the first three gears are selected. Use D to provide engine braking when going down a steep hill. D can also keep the transmission from cycling between third and fourth gears in stop-and-go driving. • For more power when climbing. • To increase engine braking when going down steep hills • For starting out on a slippery surface or in deep snow. • To help reduce wheel spin. 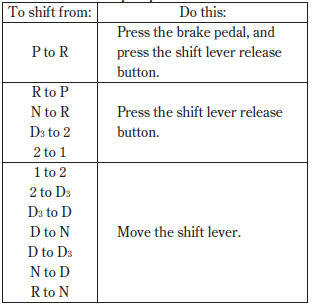 By upshifting and downshifting through 1, 2, D , and D, you can operate the transmission much like a manual transmission without a clutch pedal. With the paddle shifters, you can operate the transmission much like a manual transmission without a clutch pedal. 3. Put a cloth on the notch of the shift lock release slot cover. 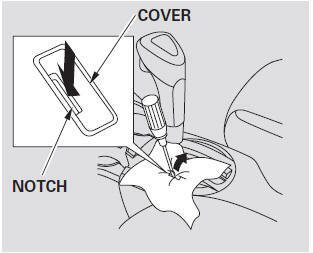 Using a small flat-tipped screwdriver or a metal fingernail file, carefully pry on the notch of the cover to remove it. 6. 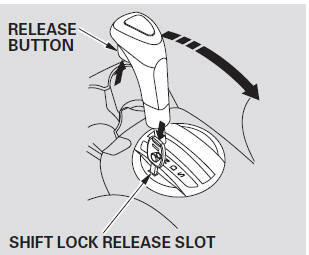 Remove the key from the shift lock release slot, then reinstall the cover. Make sure the notch on the cover is on the left side. Press the brake pedal, and restart the engine.